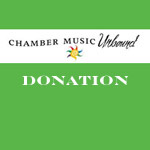 Preferred seating to all 8 Concerts of the Unbound Chamber Music Festival 2019, July 25-Aug 3 senior rate (65+). Preferred seating is reserved in forward rows. Please arrive no later than 7:25.